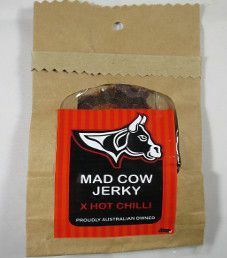 The next review on Mad Cow Jerky will be on a 0.56 ounce/16 gram bag of their x hot chilli flavor. This jerky was kindly submitted by the owner, Mary-Anne Delost (M.A.D.). 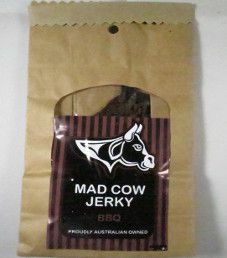 The next review on Mad Cow Jerky will be on a 0.6 ounce/18 gram bag of their BBQ beef jerky flavor. 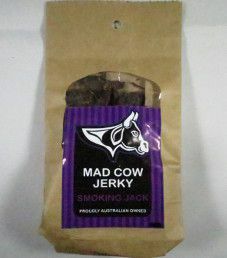 While the choice of using ‘Mad Cow’ in the jerky name seems curious, there is zero connection to any sort of mad cow disease. 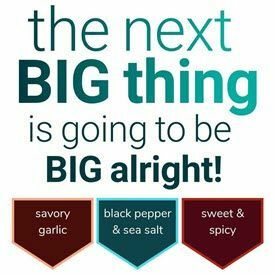 This jerky was kindly submitted by the owner and founder, Mary-Anne Delost (M.A.D.). The next review on Mad Cow Jerky will be on a 0.56 ounce/16 gram bag of their chilli flavor. This jerky was graciously submitted by the owner, Mary-Anne Delost (M.A.D.). 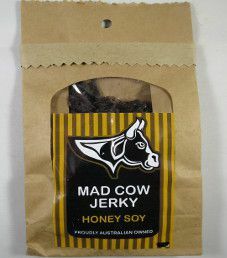 The next review on Mad Cow Jerky will be on a 16 gram bag of their Honey Soy beef jerky. 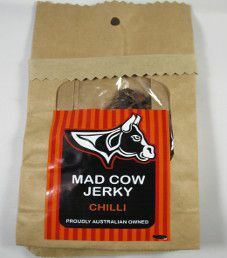 It does seem odd to name a jerky brand ‘Mad Cow’, but there is a valid reason. This jerky was kindly submitted by the owner, Mary-Anne Delost (M.A.D. ).